Sept. 11 Victim Identified, Nearly 17 Years Later Scott Michael Johnson, identified by the New York City Office of Chief Medical Examiner, was a securities analyst at an investment banking firm. More than 1,100 victims have yet to be identified. 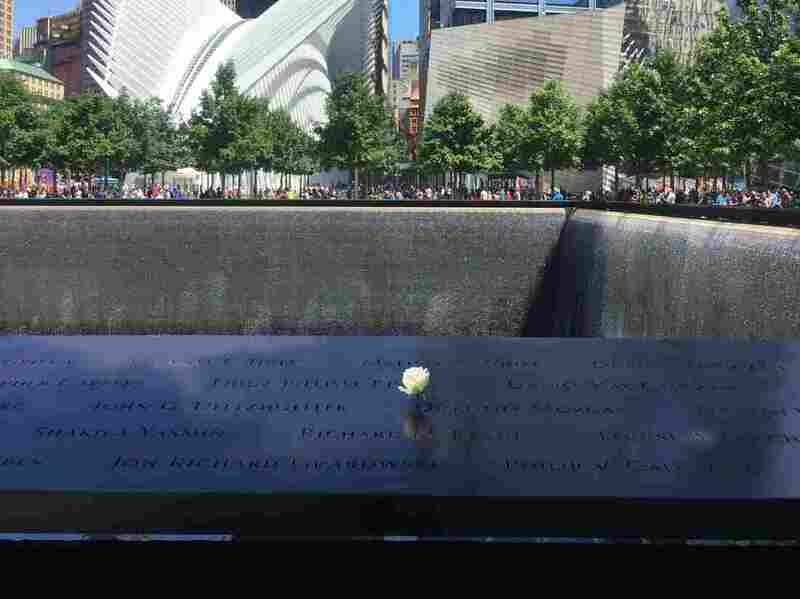 New York's 9/11 Memorial honors victims of the attacks. On Wednesday, the Office of Chief Medical Examiner announced it had identified the remains of Scott Michael Johnson, a 26-year-old securities analyst. His name was Scott Michael Johnson, and he was 26 years old when a plane flew into the World Trade Center tower he worked in on Sept. 11, 2001. New York City's Office of Chief Medical Examiner announced the news on Wednesday. "In 2001, we made a commitment to the families of victims that we would do whatever it takes, for as long as it takes, to identify their loved ones," Chief Medical Examiner Dr. Barbara Sampson said in a statement. "This identification is the result of the tireless dedication of our staff to this ongoing mission." Mark Desire, the assistant director of the office's department of forensic biology, told NPR, "We work on World Trade Center identifications every day." There were 21,905 remains recovered from the World Trade Center, he said. And most of those samples were bone, which is difficult to extract DNA from. The samples had also degraded from exposure to fire, jet fuel, water, mold, bacteria and even sunlight at Ground Zero. For years, the team had struggled to extract enough DNA from Johnson's bone fragment. So it tried a new technique called "ultrasonic ball bearings." It's a process where the bone is pulverized with a piece of metal. Once the fragment became a fine powder, researchers then treated it with chemicals, extracted DNA and generated a forensic profile. At last, they could compare that profile to a toothbrush the Johnson family had given them in 2001. "This commitment to the families is as great today as it was in 2001," Desire said. Johnson — a securities analyst at Keefe, Bruyette & Woods, an investment banking company — is the 1,642nd person to be identified. About 40 percent of victims still await identification. When Ann Johnson was notified that her son's remains had been found, she told The New York Times that she wept. "You get pulled right back into it and it also means there's a finality," she said. "Somehow I always thought he would just walk up and say, 'Here I am. I had amnesia.'" The family can decide whether it wants to collect the remaining bone fragment, Desire told NPR. "The ability to give something physical back to the family, to return a loved one, is important," he said. "Whatever we have, we will release that as the family wishes."